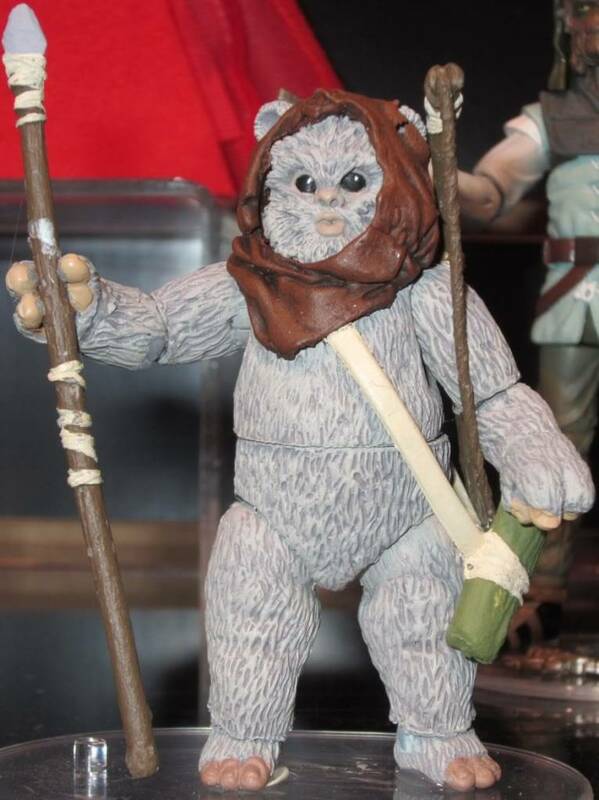 Hasbro confirmed today via a Q&A session, that the next Ewok in the 2012 vintage line will be Lumat. Lumat was one of the original vintage figures, but has yet to be resculpted for any modern line. 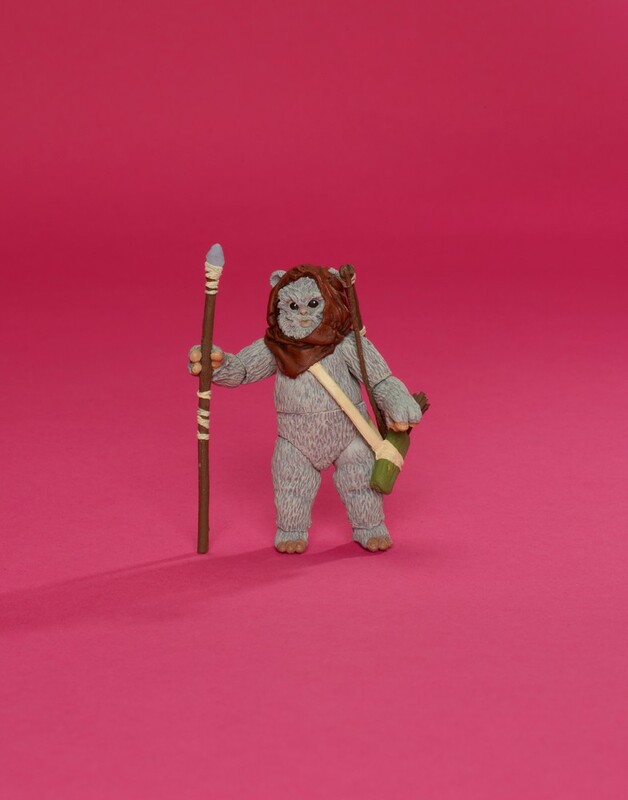 There was a debate as to which Ewok character was actually Lumat, so we'll have to speculate about the likeness of the figure until Hasbro releases more details. Hooray! Lumat! No word yet about Kneesaa or C-Trok? Yeah, first the vinatge Lumat was THE Lumat, what ya saw was what ya got. As seen in the pic. However, when the Star Wars CCG from Wizards of the Coast released their Endor expansion pack, Lumat was labeled as "Graak," which is why the modern Graak figure looks suspiciously like Lumat, and in fact, on Hasbro product sheets was called Lumat. Silly Hasbro and Wizards. Just give us Lumat. It's got me wondering what sort of accesories they'll pack him with? The usual spear and magic helmet...er, I mean, bow and awwows? Darn it, now even Elmer Fudd is getting into our Ewok debates. Seriously though, great, we get Lumat! I'm hoping that we get the REAL Lumat. The one that the original Kenner figure was based on. I never have liked the idea of reassigning names. 2) With the release of the rescaled Logray this year, we now have all of the Vintage Ewoks in the proper scale except for Lumat (who hasn't been released at all in the modern line) and Teebo (who was released in the Power of the Jedi series and is now very out-of-scale). Are these Ewoks in your plans to complete the Vintage Ewoks set in the near future? Answer: This is a great request - both of these Ewoks are in our line of sight to be updated. We already knew about Lumat, but here is more confirmation of Teebo. Just popped over to Sir Steve's Guide to check out the Hasbro Q&A from other sites. I was hoping that there'd be some new rumors of Lumat or any Ewoks or Droids merchandise for that matter, but nope. No questions. And Lumat didn't pop up at Comic Con. They haven't said anything recently (that I know of) about any Ewoks, Lumat, Kneesaa, C-Trok, Teebo. And virtually no Droids figures at all. It's all "Clone Wars this" and "Clone Wars that", and really, do we really need more Clones or the same Anakin, Yoda, Kenobi, or *shudders* Cad Bane? They put out the same old stuff. And they re-pack old, old, figures every year. Sorry. Just a little bitter that more OT stuff isn't as readily available. Whare are our Ewoks? Where are our Droids? sadface. Toy Fair is next month, so I am hoping to see a preview of Lumat for the basic figure line, as well as the Ewok exclusives. I hope after all this waiting that we get some love from Hasbro. AWEsome! The little guy looks great. You can tell he's not completely a new sculpt. They did a re-paint on Logray's body, and put him in the same hood as Graak, but whatever, the face is still Lumat, and he's different from the 07 Graak and Warok. He's Lumat, and I'ma buy him! I'm glad that Lumat is finally coming and that he is based on the Kenner ROTJ card picture. I do miss how each of the original Kenner Ewoks did have a completely unique sculpt though. Lumat's parts are pretty recognizable. Yeah, the old Kenner 'woks all had different and unique sculpts. Particuarly Lumat. when I was younger, I used to refer to him as "The Ewok with the weird arm," because his arm was curved, like that of the other "weird armed guy's," the Cloud Car Pilot. Heh. The only new part is actually the head from what I can tell (not even the hood). Since they put little effort into him, it would have been nice to get an alternate hood (from the cartoon) or a good accessory - like a wokling. I know what you mean. They could've included Wiley as a wokling accessory, since Lumat is the father of Latara, Nippet, and Wiley. Lumat is up for pre-order on Amazon.com - this figure and the entire wave are an online exclusive - order now if you want one! By the way, if your order is $25+ shipping is free on Amazon. I checked Amazon.ca, the Canadian version of Amazon, and didn't see Lumat or any other figures from that wave listed. I wonder if only Amazon's American branch is going to be carrying these? I pre-ordered Lumat for $12.99 on amazon last night. He's not scheduled for release till Nov 30, and he'll ship to me by like, December 10th. That's a 3 month wait, if you don't count August, but oh well, at least I've secured a Lumat figure. No word yet on the K-Mart exclusive Ewok Scouts 2 pack of Wunka and Widdle. James wrote: I checked Amazon.ca, the Canadian version of Amazon, and didn't see Lumat or any other figures from that wave listed. I wonder if only Amazon's American branch is going to be carrying these? For anyone who ordered Lumat from Amazon - he is shipping now. I received mine today - another good Ewok to add to the tribe.